Remember the days when we used to long for the postman’s arrival, hoping he’d have something for us? And if it was festive season, we waited eagerly for bright, glossy greeting cards from our friends and relatives who lived far away! Such was the charm of a handwritten letter or a handmade greeting card, something that’s a little hard for the current generation of kids to understand! Yes, emails and e-cards have made life a lot easier (and cheaper), but they’ve become way too generic and lack the personal touch of a handmade card. We’ve decided to bring back the handmade greeting card this Sankranti, with a one-of-it’s-kind DIY Quilled Sankranti Greeting Card! 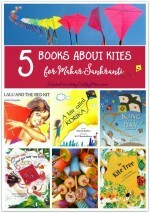 Our project today features a cute little birdie holding in it’s beak the best part of Sankranti – a kite! 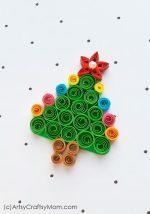 For basic quilling tips, check out our post on Quilled Christmas tags, where we explain how you can make tight coils and tear drop shapes. 1. Let’s begin with our watercolor paper. Use a sheet that’s 20 x 25 cm and draw a sky and a hill on it. 2. Paint in the sky and hill using cobalt blue and sap green watercolor paints respectively. If you’d rather not use paints or your kids are helping you, you can use blue and green construction paper instead. Let the paint dry. 3. Next up is the flowers on the hill. First make a tight coil using a full yellow strip. Once the tight coil is ready, push the center outwards and pinch it on one side, creating a fold called the ‘pegged tear drop ‘. For each flower, make five such petals. 4. 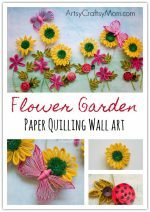 Join the pinched points together to create a flower. I made three flowers with full strips and two with a half strip, but the size of the flower is your choice. Once the flowers are ready, stuck a pearl in its center. If you don’t have a pearl, don’t fret – just make a small tight coil with white strips and stick it instead. Stick the flowers at random places on your watercolor hill. 5. For the leaves, make sixteen tear drops using green half strips, and attach them to the flowers. 6. 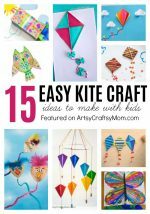 It’s time for the best part – the kite! Our kite is going to have four sections in different colors. For each section, using full-length quilling strips to make triangles from open coils as shown in the picture below. 7. Once dry, stick the triangle sections together to form a kite and stick it on the watercolor sky. To give the shape more definition, make four small tight coils in a neutral color. Stick three of the coils in the top three corners of the kite. 8. Twirl two half strips to make the tail of the kite, and use a plain strip for the string. Fix them to the bottom corner with the last tight coil created in the previous step. 9. It’s time to make our little friend, the birdie! To create the bird’s body, take four different shades of purple quilling strips. Stick the edges of these strips together to form one big strip of four different colors, and made one big open coil. Make this open coil a teardrop shape. Stick the bird’s body on top of the watercolor hill. 10. For the tail feathers, take three shades of purple together, and made loops, going from small to big, and arrange them from inside to outside. Make four of these and attach them at the tip of the teardrop created in the previous step. 11. Make a triangle using a 5cm long red strip for the beak and stick on a googly eye. 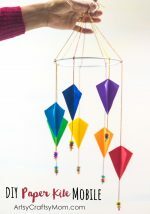 Connect the bird to the kite by attaching the loose end of the kite string to the bird’s beak. 12. Your hill and sky scene is ready! Once the entire project is dry, stick it on white construction paper folded as a card. Now write in a cute message and your DIY Quilled Sankranti greeting card is ready! 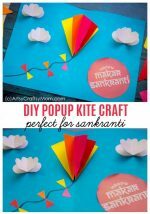 This Sankranti greeting card is a simple craft that even quilling beginners can try – it uses just basic quilling shapes. Make a few of these to gift your friends, your neighbors and family – it’s so much better than an e-card any day!